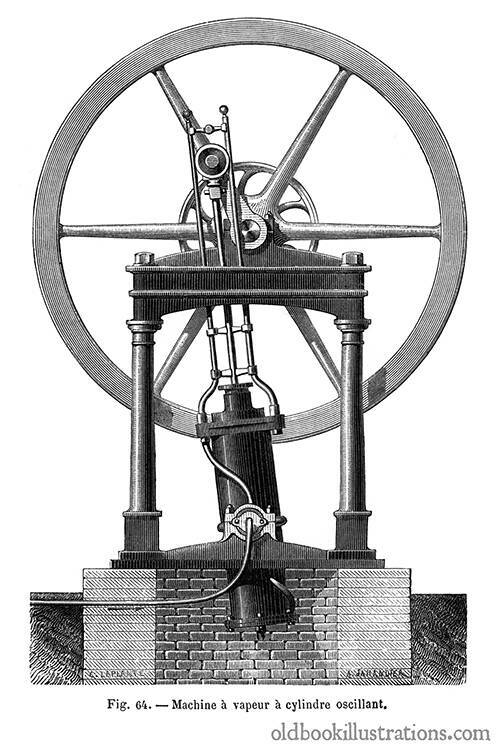 In an oscillating steam engine, the cylinder itself is used as a steam valve. Transmission occurs without the need for connecting rods since the piston rod is linked directly to the crank of the driving shaft. These characteristics make this type of engine fairly easy to build. In 1876, the author of the book was already stating that it wasn’t very much used in industry anymore, and he mentioned small steamboats as still relying on it. Today we could mention toy steam engines, which are often built according to this design. The caption reads in the original French: Machine à vapeur à cylindre oscillant.